It is strange to be writing to you all on a Tuesday! I hope you all had a wonderful Memorial Day. Our day was great! I’ll get to that later though. First off, spring has finally sprung here in Montana. The trees are all in blossom and the grass is plush and green. Walking around town is like walking in a flower garden There’s tons of cottonwood flying around too, just like at home. I think my allergies would like regular snow more over cottonwood snow though! Last Monday night, we had a really nice evening with a part-member family. They fed us dinner, and we did Family Home Evening for them. We ended up talking about how trials make us stronger and better. To illustrate this, we showed how a plain, flat piece of paper couldn’t fly very far. But with every “trial”/fold, it eventually was made into a paper airplane, and then it could fly! We then had a paper airplane competition out in the backyard. It was so fun! They are an awesome family and I love working with them. Early this week, we had another lesson with our new investigator. It went great! We brought the 2nd Ward sisters with us, because we actually had to transfer her over to them because she was in their area. So sad! It’s all God’s work though, so it’ll be good. We did a lot of service earlier this week too, especially helping people pack and move. I’ve decided that I am going to have significantly less junk around my apartment when I get home! Wednesday night, we went to dinner with Alex and her mom. It was such a nice evening! They had been wanting to take us out to dinner as a “thank-you” for the baptism. We went to a really cool new restaurant in downtown Bozeman called “Open Range”. It was seriously the best meal I think I’ve had since coming out on my mission. Our ward is the best. Here’s another really nice example: so on Sunday during gospel principles, we were talking about fasting. I made the comment that I can rarely do a “true” fast because of my medicine, but the way I fast is by eating very simply and small. I made the example that instead of eggs, bacon, etc, I have just a piece of toast. Sister Jones made a comment that “Sister Hoggan, you’re a missionary, you never get eggs and bacon!”. We all laughed and moved on. After church though, a sister came up to us and said, “Sisters, I have a pound of bacon and a dozen eggs at home that I want you to come get. And I won’t take no for an answer!”. SO NICE! So we had eggs and bacon for breakfast this morning!! 🙂 It’s little things like that that just make your day as a missionary. So here’s a random interesting fact about me lately- I’ve taken to drawing! I’ve always enjoyed art, but I never really took any time to develop any skill in it. Well, lately I’ve been doodling anything and everything I can find a picture of. I don’t have any pictures of what I’ve done with me, but I’ll try to remember to send some home soon. My latest “collection” (haha) is a bunch of cartoon farm animals on sticky-notes up on our closet door. We named each of them with Book of Mormon/LDS puns… hahaha. For example, we have “Melchize-duck” the duck and “Moo-riancumer” the cow. On Saturday, we went to a baptism for the 1st ward sisters. It was so nice! The 2nd ward sisters are having a baptism next weekend as well (it’ll all be in Spanish though… that’s be interesting to attend, lol). After the baptism on Saturday, Sister Jones and I finally got our interview with President Mecham! He interviews all the missionaries every 3 months, and our district was the last ones for this round. It was so great to get to talk with Pres. Mecham- he is truly an inspired and wonderful man. I was also able to talk to him about something that had been weighing on me. Last week, I found out that they had pulled the full-time missionaries from Meeteetse and made it a shared area again. I just wanted to cry. I talked to President about it though, and he said he is planning to put more missionaries there soon, and until then I had his permission to contact the Sisters in Cody who are covering Meeteetse and talk to them about my promptings for that area. In fact, President said that he expected me to have 6-10 phone calls with the Cody sisters over the next couple of weeks. That really helped me out a lot! Sunday was a great day and we met a lot of new less-actives! We were able to add two new families to our teaching pool, and we are going to teach the discussions to one of the family’s 7 1/2 year old to get her ready for baptism. Yesterday (Memorial Day) was so good too! 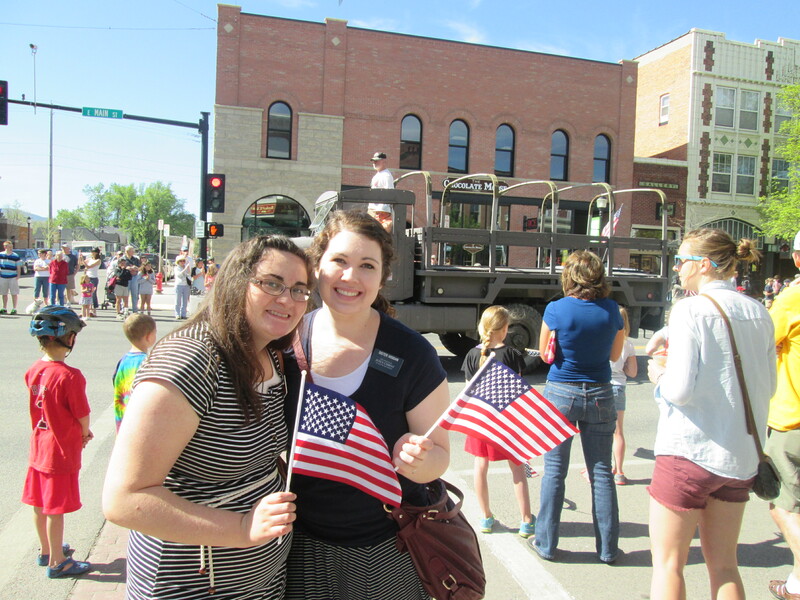 We went with the 1st ward sisters and got free breakfast and then watched the parade downtown. Then later Sister Jones and I went to the planetarium show at the museum, which we had free tickets to. We had a great cookout with a family in the ward, and just generally had a really nice day. It was amazing how much more time you have when you don’t have to email! So that’s me for this week! Thank you all for your letters, your prayers, and your support. It really means so much. I love you and miss you! Have a great week! !